Model & Year: 92-95 3-Series, U.S. This write-up is for those who wish to upgrade their stock audio system while retaining a tasteful factory appearance. Although written specifically for 3-series cars, it is generally applicable to all BMW's. And there is good reason to upgrade. For starters, most pre-'96 radios are beginning to have display problems (dim display or burned pixels). And by swapping in better speakers or an amp, you can improve sound quality. But most interestingly, by upgrading to a '96-on radio you'll be able to use mp3 CD changers, USB and Bluetooth interfaces, and other devices thru auxilliary input adaptors. All removal and replacement procedures are in the Bentley or Haynes service manual, therefore I will only add additional procedures as necessary. REMINDER: when working with factoty radios, be sure to have the BMW security code! If you're mostly happy with your factory system, replacing just the radio is an easy upgrade. A good source for used radios is eBay. Another great source for radios and accessories is German Audio Tech. While none of these radios operate "old" pre-'96 CD changers, they can be made to operate newer changers or iPod/USB interfaces by upgrading the data cable and power plug. See Data Cable below. Be aware the CD43 is the only one that responds to steering wheel controls when coupled with a multi-function steering wheel. Popular and affordable iPod/USB/Bluetooth adaptors are sold by Grom. 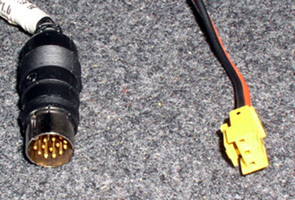 Other auxiliary input adaptors can be found at BlitzSafe. Note these devices work only with the updated data cables and radios metioned here. 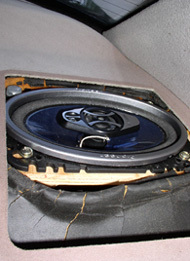 Building on the previous step, swapping in better speakers is an easy, inexpensive upgrade. However, this will bring only slight improvements in your sound quality unless paired with a new amplifier. 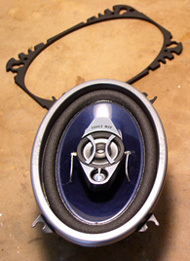 Some have recommended cutting out the foam backing behind the front kick panel speakers to improve bass response. I have found this may also cause resonance and vibration to occur, so be advised. The rear speakers can be changed by just removing the grille covers, leaving the speaker enclosures in place to save time. I recommend Crutchfield for plug-in speaker upgrades. Even at moderate volume levels, the rear speaker enclosures don't produce bass very well - even with new speakers. 4x6 speakers can be top mounted in place of the enclosures, with a little extra work, for much better bass response and a noticeable sound improvement. 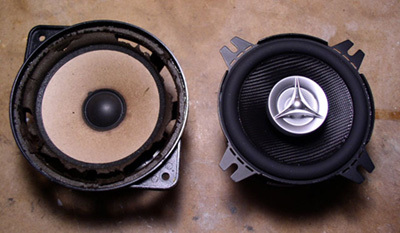 I used Pioneer TS-A4670R, 3-way speakers (image below left). There is absolutely no room to work with metal cutting tools on the rear deck, so you'll have to use the existing speaker cut-out and screw holes. 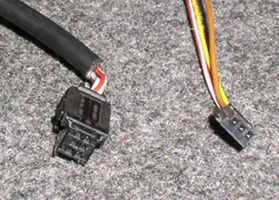 Cut-off the factory electrical connector and splice in the provided speaker wire connectors. Use heat-shrink tubing. See image above center. Next, cut out a template from 1/4" plywood (which serves to elevate the speaker) and mount the provided factory speaker template with speaker to the plywood. Then secure the plywood using bolts or large screws thru the existing holes in the rear deck sheet metal. See image above right. Replacing the old CD changer's M-bus data cable (which runs from radio to trunk) with the newer I-bus version (p/n 65-12-8-369-830) and matching power plug (p/n 61-13-8-377-072), will allow you to add a matching I-bus CD/MP3 changer and control it from the radio. It's also used to connect with any iPod, USB, Bluetooth, or aux-in interface. See images below. This change requires one of the three radios specified above. With new cable and power plug installed, '96-on factory changers (and iPod/USB interfaces) will be plug-n-play, such as the current factory MP3 changer (as sold by BimmerNav). To obtain the proper terminal for your connector, use p/n 61-13-1-376-206. After attaching the diagnostic wire from the trunk, push the terminal into your connector with a small screwdriver. These terminals have tiny one-way barbs and cannot be easily removed once pressed into position. 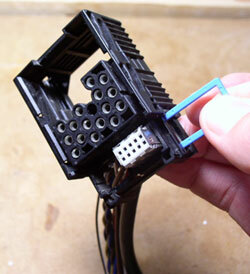 Release old data cable from radio wiring harness by removing blue retaining clip. See image below left. Install new I-bus cable into harness (5 min). Remove OBC and parcel shelf, then remove shift knob and shift cover (30 min). Remove center ashtray/cup holder, then rear ashtray and surrounding trim (20 min). Remove rear bench seat, left side bolster, and left rear speaker. See image right, below (30 min). Gather new I-bus cable and diagnostics wire and check length (5 min). Proceed to run both behind the OBC/parcel shelf, around the left side of the shifter, and underneath the center console/cup holder. Use tie wraps (15 min). 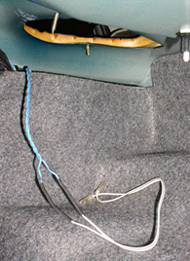 Push wires thru center of rear console/arm rest, then under carpet to left side passenger seat footwell (45 min). 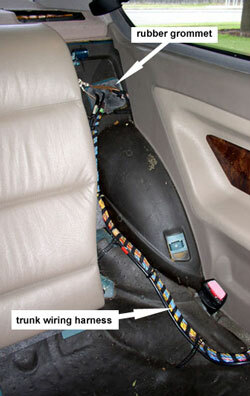 Now route wiring in with existing trunk harness and thru rubber grommet to trunk (15 min). See image below right. Since BMW head units do not display text or allow direct folder access, mp3 disc navigation will be a concern. Therefore, you may want to limit your mp3 discs to a "flat file" format of about 40-50 songs each, with each disc representing a playlist or genre. Use CD-RW. I like to think of this installation as a regular CD changer with "bonus" capacity. For a large capacity mp3 solution consider an iPod interface or an aux-in for phone-based music. Running the data cable down the left side and under the driver's side door sill is an option too, but I've found those plastic parts break easily, making it difficult to put back in place securely. Replacing the factory amplifier will require even more involved wiring. Doing so however will afford you the most flexibility in improving the sound quality. To achieve the best results you will need to tune your amp's crossover/gain settings to match your speakers. Since there is no plug-n-play aftermarket amp, you will need to clip off the factory wiring harnesses (2) and use wiring diagrams to splice in. This will also allow a subwoofer to be installed and mounted in the trunk. Mounting these components will need some consideration too. Be careful of engine noise creeping into your new amp installation and, if mounting a sub, test for undue resonance and vibration.